Cherokee Glen is a unique Ocean Springs neighborhood encompassing sixty wooded and well-drained, acres. It is situated in the very western part of the city on the Fort Point Peninsula, which combines areas familiarly called “Lover’s Lane”, “Seapointe”, and “Davidson Hills”. The northern portion of the Cherokee Glen land subdivision fronts on Old Fort Bayou. Legally Cherokee Glen is described as a part of U.S. Government Lot 5, Section 24, T7S-R9W. Mr. Plummer was born in Connecticut, and was in Jackson County for the Federal Census of 1840. It is believed that J.R. Plummer married Mary G. Porter (1808-1878), the sister of Martha Porter Austin (1818-1898). He made his livelihood as a farmer and land speculator. Mrs. Austin was the wife of Dr. William Glover Austin (1814-1891), a New Orleans physician who built the Ocean Springs Hotel in 1853. The Porter family had also settled at Ocean Springs in the 1840s. They were originally from Giles County, Tennessee and were merchants at Ocean Springs. Porter Street or is it Porter Avenue? was named for this pioneer family. U.S. Government Lot 4, Section 24, T7S-R9W was also the locale for Fort Maurepas, the French beachhead, established by Pierre Le Moyne (1671-1706), Sieur d’ Iberville in April 1699 and the Biloxy settlement of 1719, when the French colonists move the capital of La Louisiane from the Mobile area back to the original Biloxi Bay site. Both of these French Colonial settlements were situated on a prominent topographic feature, a NNW striking ridge, which runs from the southeast corner of U.S. Government Lot 4 for approximately 3500 feet where it terminates in a marsh. This ridge reaches an elevation over twenty feet above mean sea level. This area became known as Vieux Biloxey, when Nouveau Biloxey (present day Biloxi) was founded about 1720. This historical fact gives Biloxi an excellent opportunity to revisit “their Tercentennial” again in 2020. Standby you party people! J.R. Plummer built a brick home overlooking Biloxi Bay on his sixteen-acre parcel in the southeast corner of U.S. Government Lot 4, Section 24, T7S-R9W. His residence in time became known as the Plummer Brick House. It may have been built with local brick produced by Kentuckian, William Gray Kendall (1812-1872), U.S. Postmaster at New Orleans in 1854, and a summer resident of Ocean Springs. In January 1846, Kendall established a fifty-acre estate in Section 30, T7S-R8W with 800 feet fronting on the Bay of Biloxi. On this beautiful, high ground facing Deer Island to the south, he built a residence, icehouse, and school. Today this property is divided and owned by the heirs of Ruth Dickey White Scharr (1913-2000) and George E. Arndt II (1909-1995). It lies between the Shearwater Pottery and the Blossman Estate and is the site of “Shadowlawn”, the former Hanson-Dickey House, and our premier bed and breakfast inn. Elizabeth Jane A. Maginnis and Arthur Ambrose Maginnis reared a large family at New Orleans. Their children were: Sarah Eugenia M. Nolan (1841-1894), John Henry Maginnis (1845-1889), Arthur Ambrose Maginnis Jr. (1846-1901), Emma Isabel M. Gilmore (1854-1901+), Charles Benjamin Maginnis (1856-1909), Margaret Cecelia M. Pescud (1857-1905+), William D. Maginnis (1862-1938), Laura Elizabeth M. Penrose (1863-1905+), and Albert Baldwin Maginnis (1864-1917). After Elizabeth Jane Maginnis expired in 1901, her succession revealed that her heirs were: William Daniel Maginnis, Margaret C.M. Pescud, Elizabeth M. Nolan Becnel, Emma I. M. Gilmore, A.B. Maginnis, Emma Nolan Maurin, Martha N. Gilmore, Charles B. Maginnis, Laura M. Penrose, John T. Nolan, and Samuel L. Gilmore. At Ocean Springs, they were legated the sixty-acre parcel in Lot 5, Section 24, T7S-R9W, as well as Mrs. Maginnis’ other family property here, which included the Maginnis Estate on Front Beach Drive. Civil War military service records indicate Franklin B. Parkinson enlisted in Company B, Orleans Guards, Louisiana Military Regiment on March 8, 1862. He was immediately transferred by Governor T.O. Moore to a unit for the local defense of the City of New Orleans, commanded by Major General Mansfield Lovell, CSA. (Booth, 1984, p. 73). In 1910, B.F. Parkinson was living at Ocean Springs with his cook, Bell Riley (1887-1910+), and yardman, Solomon Carter (1881-1910+) and his wife, Fannie Carter (1886-1910+). He was not here for the 1920 or 1930 Federal Census. Julia Smith had immigrated to America in 1847. After the death of John Hayes, she married Jose’ (Joseph) Catchot (1824-1900), an 1842 immigrant from the island of Minorca, a Spanish possession in the western Mediterranean Sea. Senor Catchot was the son of Jose' Catchot and Eulalia Derany. Joseph Catchot and Julia Smith had a son, Antonio John “A.J.” Catchot (1864-1954), born at Ocean Springs. In his mature years, A.J. Catchot carried the appellation “Captain”. Schuyler Poitevent (1875-1936), the first historian of Ocean Springs, who once resided at present day 309 Lovers Lane, wrote the following about the Joseph Catchot Place, in his unpublished book, Broken Pot, which relates the French Colonial history of this region. In 1911, Tony Catchot began his long political service for the citizens of Ocean Springs in 1911, when he was chosen Alderman-at-large. He officiated in this office until 1917, when he began sixteen years of continuous service as Mayor. Morris McClure (1884-1940) replaced Catchot in 1933. The "new" Ocean Springs Public School was erected on Government in 1927, during the Catchot mayoral reign. 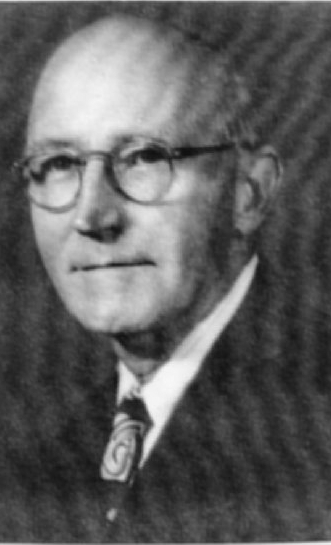 His son-in-law, Calvin Dickson Hodges (1893-1958), was a member of the school board at this time. In November 1911, A.J. Catchot sold his natal home in Lot 5, Section 24, T7S-R9W, to Dr. Thomas S. Dabney (JXCO, Ms. Land Deed Bk. 37, p. 411). Dr. Thomas Smith Dabney (1851-1923), who would become an authority on tropical diseases, was the seventh son of the sixteen children of Thomas Smith Gregory Dabney (1798-1885) and Sophia Hill (1810-1854+), both Virginians from King and Queen County. Thomas was born on his father’s plantation, Burleigh, situated south of Raymond, Hinds County, Mississippi. He married Ida Mae Ewing (1858-1900+) whose parents were from Kentucky and Louisiana respectively. Dr. Dabney’s older sister, Susan Dabney Smedes (1840-1913), published Memorials of a Southern Planter in 1887. It seems that the arrival of the T.S. Dabney family at Ocean Springs met two salient requirements-a retirement place for Dr. Dabney and a place for his son, Thomas Ewing Dabney (1885-1970), to recuperate from a bout with the virulent yellow fever that he had contracted while Secretary of the American Legation in San Salvador. Dr. Dabney had attended Tulane University at New Orleans. In the 1870s, while a medical student, he left school briefly to assist in a yellow fever outbreak near Brookhaven, Mississippi. While in the field, serendipity discovered Dabney in the guise of an herb that was being utilized by Native Americans camped in the vicinity. From this plant, Dr. Dabney developed an efficacious treatment for dropsy. He also achieved international acclaim when he diagnosed the first human case of anthrax. In 1898, Dabney reported the first case of hookworm in Louisiana. Pure Jersey milk delivered one hour from milking time. In November 1914, Thomas E. Dabney acquired The Ocean Springs News from Albert Enos Lee (1874-1936). He ran a good local journal pregnant with salient information and news germane to the populace. In mid-July 1916, Dabney suspended production of The Ocean Springs News. He had gone to Pensacola, Florida in April and secured a position with The Pensacola Journal. Mrs. Winifred M. Dabney, and E.T. Simpson (1884-1960) ran The Ocean Springs News in his absence. In the United States of America today, the largest concentration of Girot family members are situated primarily in Grundy, Will, and Massac Counties, Illinois. Some Girots are also in California, Utah, and naturally Louisiana. In 1868, Leopold H. Girot left France for New Orleans. In the Crescent City, he found employment with the clothing firm of L. Godchaux. After three years, Leopold and Prosper Godchaux founded the tailoring company ofGirot and Godchaux. Several years late Mr. Girot commenced L. Girot, his own tailoring organization. Circa 1906, Leopold H. Girot Jr. joined the firm and with John Pfefferle, the three became partners, operating as L. Girot. Months prior to his father’s demise, in 1911, L. Henry Girot Jr. became president of L. Girot. Rene Girot(1896-1981) the youngest son, took the reigns of the Girot sartorial enterprises in 1921, when L. Henry Girot sought a career change which brought his family to Ocean Springs, Mississippi. In July 1910, Henry L. Girot married Mabel E. Judlin (1890-1956), the daughter of Peter Judlin (1864-1917) and Henriette Monteverde. Their children were: Judlin H. Girot (1912-1970), Myrle “Sally” G. Williams Staley (1913-1961), Beryl G. Riviere (b.1916), and Georgine “George” G. Nicholson (1918-1998). Although a young man, Henry L. Girot’s emotional health dictated a change of place and life style. In February 1923, he moved his spouse and young family to Ocean Springs, Mississippi. Mabel E. Girot had family at Ocean Springs as her aunt, Emma Judlin (1869-1958), had married a prominent businessman and judge, Eugene W. Illing (1870-1947). The Illings were once in the hostelry business, but at the time of the Girots arrival, they were owners of a movie house, the Illing’s Theatre, which was situated on the northeast corner of Washington Avenue and Porter, the former site of Illing’s Hotel and now the location of the First Baptist Church of Ocean Springs. In 1929, with the infrastructure of Cherokee Glen in place, Henry L. Girot became associated with the United Poultry Producers and served this organization for twenty-one years as secretary-manager. The United Poultry Producers was a co-operative of local chicken farmers, which marketed high quality eggs and poultry from their headquarters on the northeast corner of Washington and Desoto. After the sale of their large Lovers Lane home, Henry and Mabel J. Girot and Roy and Beryl G. Riviere, who had been living with her parents, erected homes on West Cherokee Avenue. Refurbishment on both early 1950s homes was commenced in 2001, by contractor, Bobby Lewis, and his construction crew. Beryl G. Riviere currently resides at 1106 West Cherokee, while her son, Rickey Riviere, will move to 1112 West Cherokee in 2002, when the work on his edifice is completed. The Mabel E. Judlin remained in the J.E. Lockard family from 1901 until her demise in July 1930. She sank and was abandoned in the New Basin Canal at New Orleans, Lousiana. Her documents were surrendered at Gulfport, Mississippi on July 31, 1933. Some of the masters who served aboard the Lockard freight schooner were: John V. Lewis, August A. Bellais (1866-1929), Joseph Roig, and P.A. Bayhi. ( Permanent Certificate No. 4, BMI N, July 31, 1933). William H. Mecom Jr. was the son of W. Hardy Mecom (1909-1992) and Lois Omega Chambers Mecom (1916-1984) of Kerrville, Texas. He and Joan were the parents of Eric Christian Mecom (b. 1963) and Andrew Lee Mecom (b. 1968). Joan G. Mecom divorced and married Mark Noel of Birmingham, Alabama. They relocated to Bay St. Louis, Mississippi in 1995. Hank Girot now resides in Lake Seminole, Georgia where he is the proprietor of the Trails End Marina and Campground situated on a bayou that flows into beautiful Lake Seminole in southwestern Georgia. In October 1994, Hank married Penelope “Penny” O’ Kurin, a native of Las Vegas, Nevada. Sloan and Sally had a daughter, Sally Ann W. Freeman. After Sloan Williams and Sally divorced, she married Fielding H. “Bus” Staley (1912-1963). Their children were: Susan Staley Hubbell Delgado (b. 1943), and Michael T. Staley (b. 1945). Beryl Marie Girot (1916-2011) was born at New Orleans, Louisiana on February 22, 1916. She married Roy Joseph Riviere (1914-2000), the son of Adolph J. Riviere (1871-1954) and Julia Herbert Clement (1877-1964), on March 1, 1945, at St. Alphonsus Catholic Church. Roy was born on June 6, 1914. (JXCO, Ms. MRB 43, p. 315) Their children were: Roy F. “Ricky” Riviere (b. 1946) and Ray P. Riviere (1947-1981). In addition to Roy J. Riviere, the family consisted of: Albert T. Riviere (1906-1948), Frank P. Riviere (1909-1937), and Edward J. Riviere (1917-1968). After WW II, the Nicholsons settled at Santa Barbara, California where they started a family consisting of three sons: Peter Terry Nicholson (b. 1949), David Christie Nicholson (b. 1951), and Craig Claverie Nicholson (b. 1953). Some of their known residences were: Santa Barbara, California; St. Louis, Missouri; Clayton, Missouri; Destin, Florida; and Ponte Vedra Beach, Florida. Terry expired in Florida on September 7, 1986. Although the Cherokee Glen Subdivision was platted by H.L. Girot in May 1926, its development was slow. One must realize that this area of Ocean Springs was considered the “country”, much like eastern St. Martin and Latimer have been until early in the last decade. Remember that Cherokee Glen and surroundings had been a poultry farm, a dairy, pecan orchards and a vine-tangled, wilderness draped in the mesmerizing Cherokee Rose before the Girots arrived here from New Orleans. Now over seventy-five years old, the Cherokee Glen Subdivision is in a very mature state of development. In 2000, W.T. and Laura E. Bolton built a lovely Queen Anne replica west of the old R.A. Broadway place at 113 Wisteria. Because of the paucity of building lots, this represented the first new construction at Cherokee Glen in many years. Although Mr. and Mrs. Girot have been gone for over four decades, their daughter Beryl Girot Riviere and her son, Ricky F. Riviere, continue to live in the neighborhood, which began as the agricultural dream of H.L. Girot. Although never a successful commercial farm, Mr. Girot did create a Cherokee Glen, subdivision with a serene environment conducive for families to live and rear their children. It is only appropriate that the entrance into Cherokee Glen be named Girot in honor of him and his family who have contributed to the successful growth of Ocean Springs. 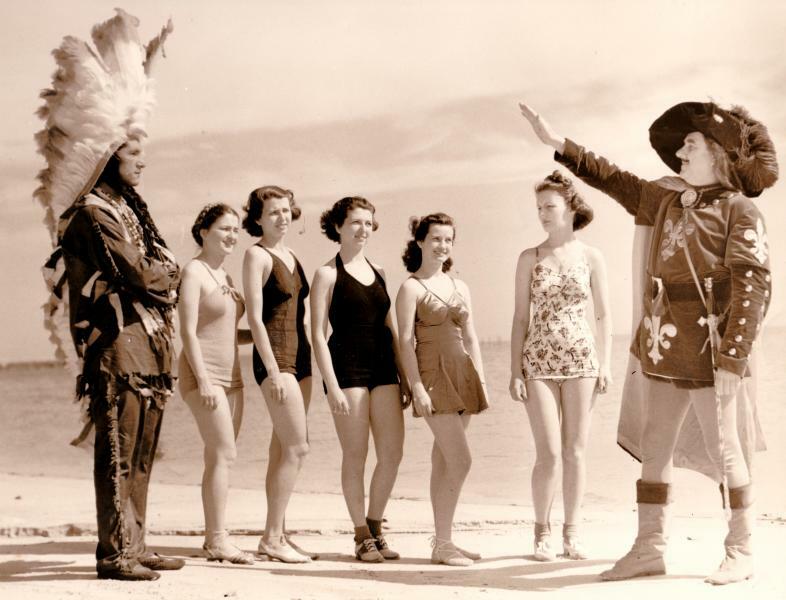 caption: The Girot Girls-In March 1939, the daughters of Henry L. Girot (1886-1953) and Mabel Judlin Girot (1890-1956) were involved in the first Landing of Iberville celebration at Ocean Springs which was chaired by Miss Mary C. O’Keefe (1893-1980). From left to right: Henry Weyerstall (1913-1987), Beryl G. Riviere (1916-2011), Sally G. Williams Staley (1913-1961), Georgine G. Nicholson (1918-1998), Annette Saxon O’Keefe (1913-1987), Mary Handy Lackey, and A.P. “Fred” Moran (1897-1967), in his first of many appearances as Iberville, the French Canadian soldier of fortune. credit: Courtesy of Beryl Girot Riviere. Andrew B. Booth, Records of Louisiana Confederate Soldiers and Louisiana Confederate Commands, (The Reprint Company: Spartanburg, South Carolina-1984). A.E. Fossier, History of The Orleans Parish Medical Society, (Fossier: New Orleans, Louisiana-1930). The Resources and Attractions of Progressive New Orleans, "Cotton Industries", (Young Men’s Business League: New Orleans-1895). JXCO, Ms. Chancery Court Cause No. 5265, “Estate of B.F. Parkinson”-June 1930. JXCO, Ms. Chancery Court Cause No. 31, 153, “Martha McCrady Gardner v. Heirs-at-Law of G.C. Gardner”, September 1976. JXCO, Ms. Chancery Court Cause No. P-4403, “The Estate of Corine J. Girot”, June 1997. The Biloxi News, "Development of Cherokee Glen is announced", June 6, 1926. The Daily Herald, “Dynamite and Dynamiting”, January 10, 1913. The Daily Herald, "Will Start Ocean Springs Weekly", July 25, 1916. The Daily Herald, “Dr. T.S. Dabney Dead”, December 29, 1923. The Daily Herald, "Ocean Springs Progressive", May 25, 1926. The Daily Herald, “Tourist Dies”, April 29, 1930. The Daily Herald, “Ocean Springs News”, September 16, 1930. The Daily Herald, “Ocean Springs Holdup”, May 5. 1932. The Daily Herald, “Ocean Springs”, January 6, 1934. The Daily Herald, “Ocean Springs News Paragraphs”, August 31, 1948. The Daily Herald, “Ocean Springs News Paragraph”, January 5, 1953. The Daily Herald, “G.C. Gardner Dies”, August 7, 1954. The Daily Herald, "Catchot, former Mayor of Ocean Springs expires", August 11, 1954. The Daily Herald, “Mrs. Mabel Girot”, November 24, 1957. The Daily Herald, "Reappoint Dr. Conti to O.S. School Board", January 15, 1960. The Daily Herald, “Mrs. Sallie Girot Staley”, December 15, 1961. The Daily Herald, “Fielding Staley Dies in Kansas From Gun Wound”, January 25, 1963. The Daily Herald, “Judlin H. Girot”, July 20, 1970. The Gulf Coast Times, “Know Your Neighbor”, July 15, 1949. The Gulf Coast Times, "Know Your Neighbor", July 29, 1949. The Gulf Coast Times, “H.L. Girot Resigns After 21 Years With Poultry Assn.”, August 4, 1950. The Gulf Coast Times, “Tylertown Editor, County Company, Purchase Times, December 22, 1950. The Gulf Coast Times, “Purchase Home in Cherokee Glenn (sic)”, May 10, 1951. The Gulf Coast Times, “Mrs. Girot New President of Woman’s Club”, June 12, 1952. The Gulf Coast Times, All City Joins in Mourning Death of Henry Girot; Funeral Held Tuesday”, January 29, 1953. The Jackson County Times, “Mr. Girot Urges Poultry Exhibits”, October 24, 1925. The Jackson County Times, “Ocean Springs Leads In Poultry Display”, November 21, 1925. The Jackson County Times, “Information Wanted”, September 29, 1934. The Jackson County Times, “Nicholson-Girot”, May 22, 1943. The Jackson County Times, “Judlin H. Girot to open office as accountant”, November 7, 1945. The Jackson County Times, “Captain Catchot Retired After 64 Years With L. & N.”, January 11, 1947. The Jackson County Times, “Judlin H. Girot Now Is Certified Accountant”, July 30, 1948. The Jackson County Times, “Albert Reviere Presumed Lost at Sea”, October 8, 1948. The Ocean Springs News, “Arndt-Parkinson (advertisement)”, February 7, 1914. The Ocean Springs News, "Boscobel Dairy Changes Hands", December 10, 1914. The Ocean Springs News, "Mrs. Nolan Succumbs To Injuries Received When Residence Burns", December 24, 1914. The Ocean Springs News, “Big Hunting Club Planned; Manager Endorses This Place”, February 25, 1915. The Ocean Springs News, "Makes His Home In Ocean Springs", November 4, 1915, p. 1. The Ocean Springs News, “Granitz Couple Celebrate 50th Wedding Anniversary”, April 4, 1957. The Ocean Springs Record, “Eleanor Conti engaged”, May 20, 1971. The Ocean Springs Record, “Dr. Conti to head association”, November 22, 1972. The Ocean Springs Record, “Mrs. George Girot Nicholson”, January 22, 1998. The Ocean Springs Record-Independent, “Cherokee Glen beautification project underway”, October 21, 1999. The Pascagoula Democrat-Star, “Ocean Springs Local News”, July 13, 1894. The Pascagoula Democrat-Star, “Ocean Springs Locals”, January 12, 1906. The Pascagoula Democrat-Star, “Ocean Springs Locals”, May 18, 1906. The Pascagoula Democrat-Star, “Ocean Springs Locals”, November 15, 1901. The Sun Herald, “Mrs. Corine Baldridge Girot”, October 5, 1991. The Sun Herald, “Vivian Barron”, March 28, 2000. The Sun Herald, "Beryl G. Riviere", January 16, 2011. The Sun Herald, "Frances Ann McKie Dunlap", March 23, 2014. The Sun Herald, "Henry J. Girot", June 24, 2015. The Times Picayune, “Insurance Patrol Founder Is Buried”, April 25, 1930. The Times Picayune, “Andrew Allison”, January 11, 1873. The Times Picayune, “Illness fatal To T.E. Dabney”, April 23, 1970. The Times Picayune, “Cotton Mill Complex Brings Latest Gleam To Developers’ Eye”, January 6, 1996. Mary Ann T. Dunn, March 8, 2002. J.K. Lemon, September 13, 1990. Beryl G. Riviere, March 14, 2002. Kenneth G. Girot, July 4, 2002. Roy M. Girot, July 4, 2002.